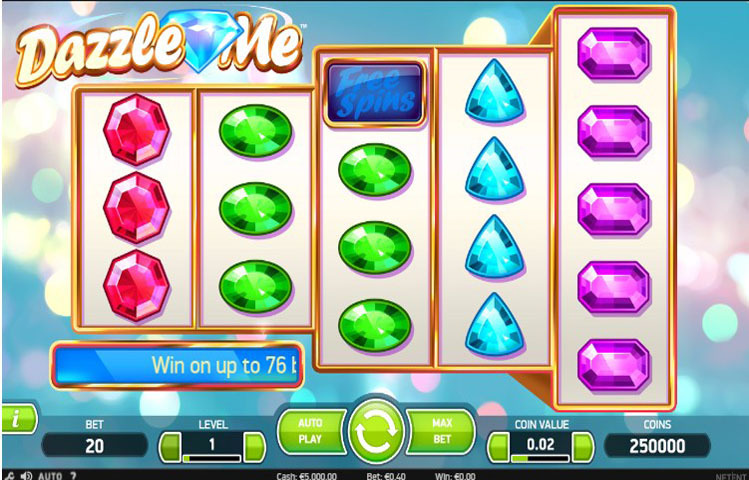 Reviews have been pouring in and players have been clamoring about the sparkly and dazzling video slot game, Dazzle Me. With lots of color, movement and an unusual setup, (that will be discussed momentarily), not to mention the winning, the feedback has been great. There are prizes for uncovering shiny gems from sapphires and rubies to emeralds, along with some old familiar slot favorites like the 7’s or bells. Some creative and fun bonus games are also included such as the Dazzling Wild Reels feature or Linked Reels. Dazzle Me offers 70 ways to stake spins, and the stakes range from very little to all-in, so players of different skill and budgets can enjoy playing. Aside from the colorful and sparkling aesthetics of the game, the actual slot screen will show 5 reels on a 3-3-4-4-5 row setup. Yes, that’s a bit unique too. So this is just another curve to give players more creative options and plays, in addition to the other features. The Bonus games are almost an entirely different world, as the action is fast and the winning potential, exciting. Get used to seeing the Wild Reel Bonus, because that is where some of the best action is at, like getting the Dashing Wild Reels Bonus. While in these bonus games, many free spins or chances to enjoy the Linked Reels feature can be had. An example of those potential winnings in some of those bonus rounds are bells paying as much as 100 coins or those lucky 7’s that can pay up to 200 coins. The positive reports coming back from this slot shouldn’t be surprising. Keeping it fun to watch and play, creating some unique and special setups and features and allowing options for players of all levels it isn’t surprising to hear this strong feedback. Dazzle Me appears to have done just that, as it has dazzled many. This Net Ent product is another winning slot, and combining the enjoyment of the gaming experience, the visual pleasure of amazing graphics with sounds and theme music that adds excitement equals Dazzle Me. This slot just may prove in the end too, that perhaps diamonds and gems aren’t only just a girl’s best friend.